Yeah, Jetryl already explained to me that the perspective is wrong for the pillar top. Its like you're looking at it straight on instead of from an isometric angle. Its no problem though, since I spent zero time making the top. I'll come up with a more fitting top piece. What I meant when I said Jetryl's wall is inconsistent was two things: one, the stones that make up the wall are of various different sizes. Two, some blocks stick out more than others, and some blocks are pushed in more than others. Making the frontal surface of the wall not entirely flat. It looks nice of course, its just not the type of wall I would expect a castle to be made out of. And yes I thought of the "looks like fresh paint" too when I saw the white and tan tiles together. It probably won't give that feeling so much if the tan tiles were not there at all. I can always tweak the shading to make the bricks look more weathered and introduce variation tiles to make the wall a little less monotonous. I'm a little cautious about making the changes too drastic though. I was already planning to do the latter once I felt this first base tile was completed. I was also thinking about making some ornamental pieces that could go on the wall (and be used elsewhere) such as torch holders or a crest representing the kingdom. - I didn't want to re-use the white colors for both interior and exterior, so I chose a new color set that is brown-ish, but not tan like the first set of tiles were. I also chose these colors to match the stone pillars I've been working on recently. - Already noticed a minor bug that would make using the same tile together horizontally look poor because of where I chose the grout outlines on the bottom tile. Should be really easy to fix this though. - The center shading bugs me. I think the "blobs" might be a bit too large and the lightest shade a bit too light. - Not sure if there's enough variation or if this wall still looks "too perfect". Its less perfect than the white walls for sure, but still not as imperfect as the grey stone wall that it rests on. I tried to strike a balance between the two, but I think perhaps a little more imperfection is needed. Addressing the issues in my last post. I added a second variation tile as well. Still not entirely happy with the shading, but meh. I'll come back to it another time if I need to. The wall in this draft was created by randomly placing the three tiles to make sure that everything looked okay. Wasn't expecting that small little brick on the bottom right section of the wall, but it should be fine. More variation, right? We should be able to setup these tiles to be autotilable and easily paint walls that way. I think I'm done with this for now. I made a new top for the stone column in the proper perspective. I think I did an okay job with it. The shadows along the top of the column (before hitting the actual base top) are a little sketchy, as is some of the shading along the sides of the top piece. Not bad for a first attempt though IMO. I think I'll also made an "indoor" version of the top section where the very top is either a plain dark brown (because its touching a ceiling and no light is hitting it) or dark brown along the top edges with a pure black center. I think I'm going to make some changes to the perspective of the base when I get a chance. The base still has that "head-on" perspective and it looks somewhat awkward when you use it with the new top piece. I think the base needs to have more depth to it, showing the circular parts wrapping around the back. I think if I take the very top ellipsis as the bottom base, and then stack two smaller ellipses on top of it and then place the bottom texture over that outline, I'll be able to come up with something that looks more correct. Okay, I've completely re-done the pillar base to provide the proper perspective. Its below, along with all the other previous drafts for comparison. I think I did a good job with the perspective and dimenions of the base, but looking at the previous drafts I realize that the shading leaves much to be desired. Especially on the right side with the lighter shades, I was having difficulty getting the shades to blend together well while still distinguishing the edges so that the form of the stacked platforms was not lost. I also think that after I get the base fixed up, I'm going to adjust the top piece so that the two smaller platforms are just barely poking out. Here's how it looks in comparison with the two previous drafts. I'm getting really close now I feel. I'm still not fully satisfied with how sharply the edges are defined on the right side of the base...but maybe its just going to have to look that way for this perspective. I'm going to go share this on some pixel art forums and see if I can get any tips to put on the finishing touches. I'll be adding this into the castle exterior tileset soon, and I'll leave some space in that tileset for future variations (square base, divets in column, etc). I got some feedback on my castle wall tiles in a pixel art forum and decided to try out some suggestions they had there. Here's the result. 1) Don't keep all the stones in a perfect brick shape. The stones were drawn so that the mortar lines were kind of squiggly, especially around the stone edges. I certainly like how it looks. The only thing that leaves me feeling :/ is that its no longer a brick wall. Now its a stone wall. Which is fine, but there should be some brick walls in the world as well, don't you think? Maybe it makes more sense to make the castle walls from stone instead of brick...but I don't know. At the very least, this new wall would be excellent for the town wall that surrounds Harrvah city in my opinion. Had a conversation on IRC about the stone/brick wall controversy and got some interesting references. Posting them here so that I can refer to them later. <Roots> I know right? But they don't look like bricks anymore. They look like stones, which is fine. But I'm like hmm, how do I make a good looking brick wall? On another note, I've been playing Lufia I today (SNES-era RPG) and the graphics are so simple it amazes me. That is, the wall is so smooth sometimes the seams _disappear_. <Jetrel> dracula X probably has some good examples..
<DDR> Hm, maintenance time. The back just fell off my chair. 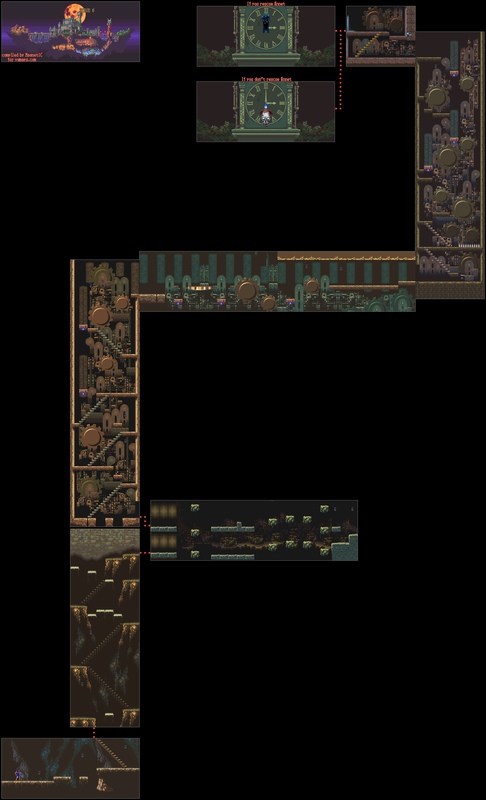 Especially the third segment there illustrates how it's often not about a single tile, but about the whole tileset - a few bricks in one place can suggest a whole wall made out of brick without texturing the whole thing. Got some external feedback on the latest column draft elsewhere today and made some pretty significant changes to the lighting. I also did something completely different with the shading on the very top as well. The latest is below next to the previous two drafts. Tweaked the elliptical shapes at the bottom of the column to illustrate my earlier statement about how ellipses never have pointy corners on them. Top is left as an exercise. New draft includes Jetryl's changes plus the results of his "exercise". I additionally made some changes to the shading on the very top section and some of the shadows of the top part of the column. I dialed down the contrast on the stone wall at the suggestion of someone else. I also created a top portion to the wall which I would like feedback on. I made many attempts to make it look more natural, for example I wanted the top-most stone on the wall to display both its front-facing and sky-facing sides, but I couldn't get it to look right. I also made an (incorrect I believe) attempt to make this sort of isometric by having a small diagonal from the front part of the wall to the top, but that definitely didn't look right and I don't think it matches our perspective either. The gate needs a lot of work as well, as it just looks too plain. The darker portions are meant to be pushed in and the lighter portions are meant to be boards that stick out. I had a reference image I was working off of when creating this, but I can't remember what search terms I used and now I can't find it. I created a basic shadow for the top of the door which probably needs some work. The door is sort of place "deep" into the wall instead of being right there in the middle of it, hence why it is pushed back and has line drawings of an archway that will rest above it. For the pillars/arches that surround the door, I started by trying to imitated Jetryl's design for the large stones surrounding the archway in the Harrvah house tileset, but the more I thought about it the more it seemed like this gate needs/deserves something different. But I'm still kind of :/ about what would best fit the type of stone structure that surrounds the door. I'm also wondering whether the door is large enough. Its about 80 pixels high on the sides and 110 pixels high in the middle (an adult sprite is about 64 pixels tall). Seems pretty short to me for being the major entryway into a capital city. And maybe it needs to be wider as well? Below is not a complete draft but a temporary WIP that I need feedback on. I was working on the door and its surroundings and here's what I got right now. 2) Does having three arch layers make the wall feel too "deep"? If you look at the top section, there are only four layers of stone so I was a little concerned with it. Do you think it would look better if I made just two arch layers instead? 3) Should I make the side walls of the inner-most column shorter (ie, less horizontal length)? The inner-most arch has much less space than the second layer arch does, but the inner-most and second columns are both of the same horizontal length right now. I think the door should be both wider and taller. I'm thinking 6 sprites abreast should be able to walk through that door at once. Also, I think the wall should be deeper. I think it should be deep enough to have a walkway on top where guards can stand and patrol. That should address the number of arches as well. 3 in that case would be fine. Also, it would be nice, though not necessary, if perhaps there was some ironwork on the door to make it beefier. 6 sprites wide is 6 tiles wide, that's a freaking huge door. That's double the width of the door I posted earlier. And if I make the door taller, the town wall is going to have to be taller of well of course. The map is only 16x12 tiles so that would mean the wall would take up over half of the screen! 1) The wall is designed for Harrvah city, so being a very long wall surrounding an entire city, its hard to imagine they'd have the materials and need for such a strong fortification in the middle of a desert. 2) Adding a walkway on top means lots of extra work for me to do. Remember I'm not a good artist and I still have an entire freaking castle to make as well, FML. 3) I asked Jetrel for feedback on IRC tonight about my earlier post and he said the perspective and depth both look fine. So there. 4) I'm lazy and I don't wanna. I'll make a wall like this for Lambdor Kingdom (chapter 2) when we get there. Or maybe someone else will be making map art for us by then. I do like your suggestion of adding ironwork to the door to make it look beefier (and less stale artistically). I'll add those details after I get the major stuff out of the way. Here's another temporary WIP snapshot. I widened the door by one tile (so now its 4 tiles wide) and adjusted the arches appropriately. I also made the bolts on the door out of iron instead of wood, as a result of gorzuate's suggestion. Still have to do all the stones for the arches and the shadows and when that is done, I can work on any fine details and touching up the door. You'll notice that the wider door has a "blank" space that is not textured near the sides where the two halves meet. I couldn't fit in another inner plank there (the darker wooden sections) so instead I'm going to use that area for some kind of ornamentation or other function. If you have any good ideas for what should go there, let me know. Also note that the inner two arches have a darker shade. This is just temporary to highlight the difference between the inner and outer arch layers because I know the shadows shouldn't behave that way (although it does look kind of nice).